Hugest thank you to all those that attended the classes at the Design School over the last 3 days, it was a amazing few days spending time with so many creative, passionate people and yabbering about design. We covered alot of stuff during the day but one of my favourite bits was yabbering about styling, be thatÂ a cool mantle, shelf, console, or tabletop. There are all sorts of rules and regulations of which I tend to ignore. All that stuff about having negative space between items so that they can breath, (rubbish) or symmetry (way too uptight for me). As I mentioned in the class the eclectic look is one of the hardest to pull off as nothing matches and yet everything has to make perfect sense. 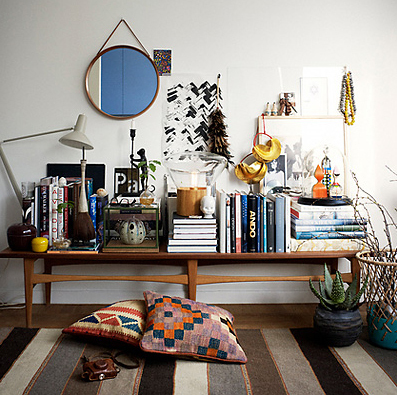 Pulling off say a rustic, or Scandinavian, or retro look is way easier as there is a very simple formula to follow. My kind of design pulls on every period, size and shape but (top top top tip) if you restrict the colour palette its so easy to pull off.Â Back to my point (apologises for the distraction) when styling say a shelf you want to think about creating a vignetteÂ that is as three dimensional as possible, by this I mean plonking things in front of things and not putting accessories in a straight line. First of all visually itâs more interesting, secondly you are consciously or subconsciously tantalising the eye so it doesn’t quite know where to look and thereforeÂ your senses are activated, whether you realise it or not. Cool hey! I leave you with an image that has no negative space (the trick to this kind of styling is to introduce lots of different heights) therefore you are creating a lively rhythm. Oh and never have a whole load of stuff one end and a few bits and bobs another otherwise it will feel like a sinking ship. Ok thatâs me done, today at least half of today is a rest day. Some work this morning and then off to a bunch of garden centres this afternoon to sort out the terribleness of our back garden where the neighbours if you are listening neighboursÂ chain sawed a 25 foot decades old wisteria so they could replace with a new straight fence, criminal! We’ve brought 10 three Â metre high jasmine but its not tall enough I need instant, instant instantÂ 25 feet planting to totally and utterly seclude us from the outside world. And I need to spend time with Mungo and Maud who were rather well behaved for the last few days and need a lot Â of gallivanting at full speed around aÂ park to let off some stream.